Silvermines Historical Society launched their sixth local history journal on Friday 3rd November 2017. Mining the Past 2018 was launched by local journalist Patricia Feehily. Patricia was born and reared in Silvermines parish, and an authority on the written word, lauded the offerings of the most recent Mining the Past. Almost one hundred photographs are ‘housed’ between the covering pages of this year’s edition of MTP and the front cover picture brings back memories of the old ‘crosscut’ saw. 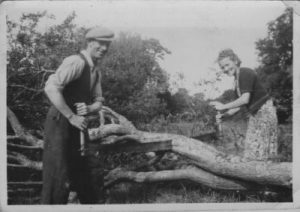 This photo was taken in Ballinaclough, sometime in the mid 1940s, with Mick Quinlan and his sister-in-law Lizzie Richardson (nee Kennedy) putting the old crosscut into action on the remains of a fallen tree, somewhere on Bayly Farm. Inside there are photos with every story and also a twelve page collection of photos from every side of the parish and beyond. These photos have been taken from the SHS Collection, an archive of photos, generously given and shared by the people of Silvermines and others. The Gleninsheen Collar found in Co Clare in 1932 and presented to the National Museum now forms parts of exhibition The History of Ireland in 100 objects and is currently featured on the Irish postage stamp for Australia. The story of its origins is outlined in Danny Grace’s article Dermot F Gleeson in Mining the Past 2018. Photographs of two fine houses – No 21 Summerhill and Carnally House Co Clare both featured in Danny Grace’s article Dermot F Gleeson Historian of All Ormond and Beyond. A photograph of Diana Princess of Wales being welcomed by Sr Columba Ryan, when she visited St George’s Nursing Home at the Augustinian Convent in Burgess Hill, Sussex is included in the poignant life story of Sr Columba Ryan from Ballinaclough. The story, Sr Columba Ryan is recorded and written by Patricia Mulqueen and Maureen Steed also from Ballinaclough. In a story named ‘Raiders of the Lost Artefacts’ by Aidan Boland, the Silvermines Giant was thoroughly researched. His name was Cornelius MaGrath, his skeleton is still housed in Trinity College and he was recently featured by Frank McNally on the Irish Times in An Irishman’s Diary.